What is this UNOPA game day parking lot fundraiser? UNOPA and UNL have partnered together to help us raise money for our association by selling parking lot stalls on Husker football Saturdays at the UNL Whittier Research Center. 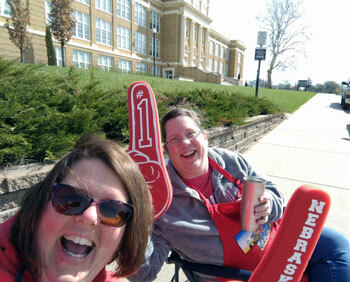 UNOPA members volunteer to spend two hours on a Saturday home game day to help sell tickets for Husker fans to park their vehicles in the UNL Whittier Research Center parking lot. UNOPA gets to keep a portion of the sells to go toward our general fund. What do we use the general fund for? What are the benefits to fundraising for our association this way versus other ways? It’s a good chance to wear your red and show your own Husker Pride! You are supporting UNL's only association solely for office staff. Members who volunteer their time, are entered into a drawing for a gift card of your vendor’s choice for each time you volunteer to work. And the best part of all...you get to spend time with fellow UNOPA members, which makes this organization what it is today, and getting to know them can make this “fun!” Who knows, your partner for that day could be a person that will inspire you to strive for better. We recognize the fact that we are all busy. At the same time, we hope you will give us just two hours of your time to support your association, UNOPA, and we are extremely grateful for everything you do for UNOPA, UNL, and the staff and students we serve! Family and friends are always welcome. Please sign up and help your association.